Like many others, I was lucky enough to receive a sample set of By Kilian’s entire L’Oeuvre Noire line through the By Kilian Facebook page. I have already tried a couple of the scents from the line, I’ve also reviewed two (Sweet Redemption and Back to Black) and my thoughts so far are generally very positive. This week I gave each sample a quick spritz to see which one I would review first and there was one that instantly stood out – A Taste of Heaven (Absinthe Verte). When I say it stood out, I mean that I literarily died and went to heaven, and if this is just ‘A Taste of Heaven’ I cannot wait to experience the whole thing. Lavender is a note that I’ve learned to love, it took a while for me to get over the obvious ‘Grandmotherly Connotations’. Unusually for me, it was two masculine perfumes that changed my opinion of lavender – Antiheros by Etat Libre d’Orange and Pour un Homme by Caron. Both are very different takes on the note, Antiheros is a casual, soapy and musky lavender and Pour un Homme is warm, chock full of vanilla and too cosy for words. A Taste of Heaven (Absinthe Verte), hereafter referred to simply as ‘A Taste of Heaven’, is an absolutely awe-inspiring lavender. I’m tempted to just leave my review there and simply implore you all to go out and try it, but that would be a bit unfair on A Taste of Heaven, it needs to be talked about. Looking at the above notes list you won’t be surprised to know that A Taste of Heaven opens with the beautiful smell of lavender. However, the lavender here isn’t overly fresh, nor is it spicy, it is warm, honeyed and like burned sugar. 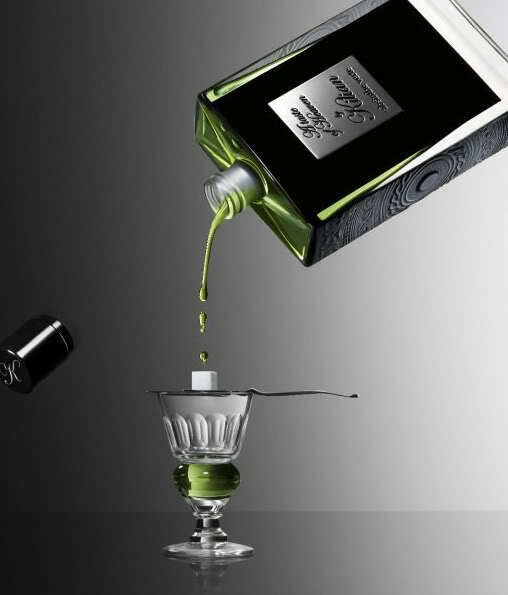 This caramel-like aspect is emphasised by the dark, anisic quality of absinthe. I’m starting to be quite fond of absinthe in perfume, it works really well with an array of notes, including; tuberose (A Travers le Miroir by Thierry Mugler), mint (Memoir Man by Amouage) and spice (Memoir Woman by Amouage). The lavender and absinthe lay on top of a bed of warm, creamy vanilla and to my nose there is nothing more pleasant than this combination. The vanilla amplifies the gourmand aspects of the lavender and it is absolutely wrist-sniffingly good. The lavender/absinthe/vanilla combo continues to hold strong for a good couple of hours before making way for a surprising chypre base. Lavender works surprisingly well with the earthy/mossy notes of patchouli and oak moss and it prevents A Taste of Heaven from becoming too gourmand by adding a much need element of dry darkness. The dark, mossy base along with the aniseed tones of the absinthe gives A Taste of Heaven an inherently masculine edge, and this is what Viktor & Rolf’s dreadful masculine ‘Antidote’ could have been if it hadn’t epically failed due to the over use of a super-strong synthetic, burned lavender note that smells truly atrocious. A Taste of Heaven is richer, darker and warmer than any other lavender fragrance I’ve tried and whilst there are lots of different notes within the composition, the lavender never gets lost, in fact each of the other notes plays on the many facets of lavender and allows it to very much stay the centre of attention. You know that feeling when you try a scent and after about an a hour or so, despite the fact that you’re still in the ‘preliminary testing stage’ you are 100% sure that you absolutely must have it? That’s what A Taste of Heaven is to me, pure, unadulterated love at first sniff. A Taste of Heaven is available in refillable 50ml Eau de Parfum and 30ml refillable travel sprays, refill kits are available for both sizes. Prices range from £41-£145. This review is based on a sample of A Taste of Heaven from the L’Oeuvre Noire sample set obtained through the ‘Kilian Club’ on the By Kilian Facebook page. Posted in By Killian, Chypre, Floral and tagged A Taste of Heaven, Anitheros, By Kilian, Caron, Chypre, Etat Libre d'Orange, Floral, L'Oeuvre Noire, Lavender, Pour un Homme. Bookmark the permalink. This is my outright favourite from the ones I’ve tried as well. It’s just *so* good! Following my disastrous encounter with the pointy sprig of lavender that is Chanel Jersey, I have become increasingly lavender-shy, indeed lavender is shaping up to the be the new civet for me. I don’t care for absinthe either, so this sample was rehomed pretty quickly as I recall. Of the original By Kilians I tried, I only kept Straight to Heaven, though recently Love and Tears and Sweet Redemption have joined it, so I am more open to the line than I used to be. Glad you love this one though – maybe it’s a bloke thing? It could be a bloke thing, I don’t normally care for gender associations but this one does feel quite masculine. Have you tried Antiheros by ELD’O? That’s a really good lavender, although I’m not sure it would cure you of your lavender shyness. Straight to Heaven was the next stand out in the line for me, there seems to be a big woody synthetic in there that in any other perfume would be annoying but in STH it really works. No, indeed – if Antiheros has marked amounts of even good lavender, it might be a no-no for me, but never say never! Never say never indeed, that said it is a very strong lavender so it might turn out to be a scrubber. Oh I’m glad you’ve fallen in love with this, I know that wonderful feeling! You have picked my Scent of the Day. You might like Dior’s Eau Noire too, have you tried it? I have trouble with traditional lavender but here it’s paired with spicy maple syrup (immortelle) and it’s weirdly compelling, with lots of oomph! What an excellent choice for your SOTD. I have tried Eau Noire, but only very briefly, that said I do remember liking it, would I be right in saying that the immortelle outweighs the lavender somewhat? I will keep that in mind next time I’m in Selfridges, I do like generously sized samples! Tommy, I felt exactly the same way about this one: instantaneous love! I was almost shocked by how much I liked it in the first few minutes, and it’s just as beautiful all the way through the dry down. I’m not a huge lavender fan, but I do really like the note. I thought that Tauer’s Reverie au Jardin was my favorite lavender, but A Taste of Heaven is giving it a run for it’s money! I’m with you there, I keep eyeing up the refill sets on the Harvey Nichols website, It seems that they aren’t spray bottles though which is a bit annoying. A Taste of Heaven is the best lavender, agreed. Like you, I can’t believe how expensive the bottles are in comparison to the refills, it’s pretty disgusting tbh. Back to black and Taste of heaven are my 2 favorites so far from the samples. I have heard really good things about Jersey and am still eager to try it. Eau noire is a favorite of mine also. HAGD. Hi Tussah, thanks for stopping by! Good choices, I love Back to Black too (check out my review). It sounds like Eau Noire is one I have to try in more detail?! I’ve heard mixed things about Jersey but it does sound worth trying. Can there be a more perfect and inviting picture for this scent than the one above? They should release it as a poster! I am sorry to say but A Taste of Heaven is superior to Caron Pour Homme in every way; it is a better quality lavender, and definitely a better drydown. I don’t even categorize Caron PUH as a perfume, instead I categorize it as a scent. A true perfume takes us on a journey from top notes to middle notes to drydown. This is what Kilian TOH does in the most beautiful and elegant way. Caron PUH, on the other hand, is a scent, the scent of the barbershop or the scent of a clean man. Perhaps, if one was new to the lavender scent and wanted to ease into it, then I would suggest Caron PUH or if one wanted to build a collection of “important” fragrances, then Caron PUH should be in that collection. Otherwise, go straight to the good stuff and buy Taste of Heaven. I’d agree that A Taste of Heaven is the superior scent, it’s just so dark and brooding, as well as being very unique for a lavender composition. Pour un Homme is still a classic though.